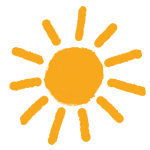 Weather is fun, so why not try some things at home or school that can help you understand it? 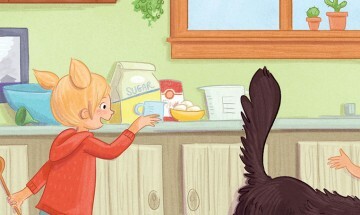 In every Bel the Weather Girl book, there are great experiments you can easily try. Here are a few more, including the most popular one from the book Weather Clues in the Sky: Clouds. Snowflakes: They’re One of a Kind! If you are lucky enough to have snow where you live this is a great one. 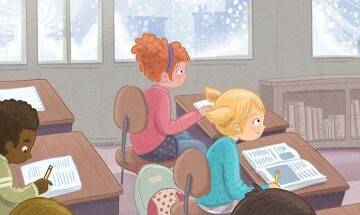 Bel the Weather Girl lives where there is plenty of snow and she loves to check out all of the snowflakes and she noticed something very interesting. Did you know that all snowflakes are different except for one thing? Do this experiment and you will see what Bel the Weather Girl found out. Place black paper or black fabric in the freezer for a couple of hours. Then take it out of the freezer and put it outside when it is snowing. Let some snowflakes land on the paper or fabric. Use a magnifying glass to see the beautiful shapes. Do you see it? No two snowflakes are the same except they are all six sided! Yes they all have six sides. Pick your favorite! Weather experiments are fun for anyone! Take a look at all the other weather experiments here! Find more snow experiments in the A Snowstorm Shows Off: Blizzards book! Bel the Weather Girl’s mom is a meteorologist and she loves this next experiment. Weather happens because of different air pressure systems arm wrestling with each other across your area. So how does the pressure change? It has a lot to do with temperature! Find a bottle with a long, narrow neck and set it on the table. The opening should be just small enough to keep the egg from falling inside. Boil and peel an egg. Quickly place the egg over the mouth of the bottle…..yes quick! What happens? The lit matches heat the air inside the bottle. When air is heated it expands and takes up more room. As the heated air expands, some of it escapes out the bottle. When the matches go out, the air inside the bottle cools, shrinks, and takes up less room, this creates a lower pressure inside the bottle than outside. The greater pressure outside the bottle forces the egg into the bottle! Yep it will get sucked into the bottle! Want to get the egg out of the bottle? Turn the bottle upside down and blow into it. The increased air pressure in the bottle will cause the egg to pop back out! For more experiments, check out The Sky Stirs Up Trouble: Tornadoes book! 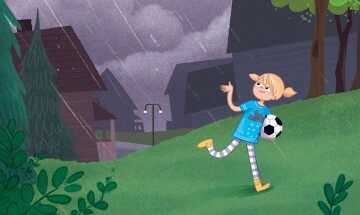 Bel and Dylan and their friends are the Crickets soccer team in Weather Clues in the Sky: Clouds Book. Did you know that you can tell the temperature by counting the chirps of crickets! Really you can! Here is how you do it: count the number of chirps in 14 seconds then add 40 to get the temperature. For Celsius: count the number of chirps in 25 seconds, divide by 3, then add 4 to get the temperature. Next time you hear crickets, start counting! Nature tells us a lot about the weather…a pine cone can forecast the weather. If it is closed it is going to rain or snow, when it is open it will be sunny and dry. Frogs also croak a lot more when it’s going to rain! This experiment is from Pg. 24 of Weather Clues in the Sky: Clouds book. The author and her friends show you how to make a cloud in a jar. You can even make one yourself at home! For more cloud experiments, check out Weather Clues in the Sky: Clouds book!